As soon as your flight touches down in Italy, you’re faced with the reality that this one trip simply won’t cut it. You could seemingly spend your entire life exploring the many Medieval villages, pastel cliff sides and historic Italian ruins and still not have enough time to get the full story. With so many places to choose from, locals will tell you to venture off the beaten path. 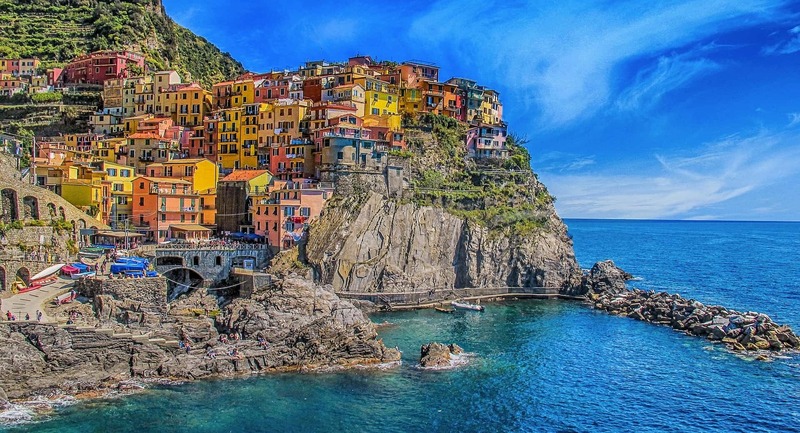 Perhaps it’s time to explore the road less travelled, jump on the train and set your sights on the Cinque Terre beaches and towns, a crescent-shaped region in the northwestern part of Italy. This UNESCO World Heritage Site since 1997 is a striking string of century-old villages nestled in the Ligurian region that sits along seaside cliffs of the Italian Riviera coastline. With five prominent towns, harbours, sand beaches, hiking trails and sweeping views, you simply can’t go wrong. To get to the beaches around Cinque Terre, you can rent a car, opt for a guided tour or hop on a ferry or charter a private boat. Of course, the easiest and most efficient way of travelling throughout the towns is by train. Thanks to an easy-to-navigate Cinque Terre train line that connects all five Cinque Terre villages, you can hop on and off at Pisa, Rome and Genoa. The Cinque Terre trains run 1-2 times per hour. There are also several tours from Florence and Pisa to Cinque Terre. Tip: If you will be travelling frequently between villages, it is recommended to purchase a Treno Cinque Terre Card that includes unlimited train rides o the line La Spezia-Cinque Terre-Levanto on the regional trains. You will also have access to all hiking trails in the National Park. If you are adventurous, you can always hike the Cinque Terre trail (if it’s not closed). 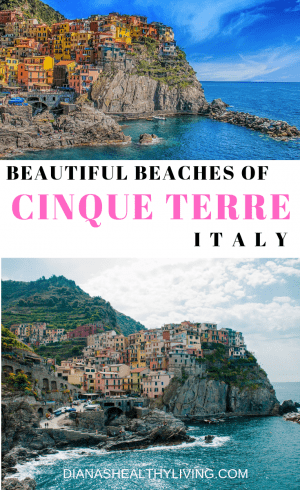 Be sure to pack a towel (rentals will set you back €10), limoncello and a camera, because it’s time to explore the top 8 Cinque Terre beaches with us. The village of Monterosso has two sides and is connected via a tunnel. Also being the largest and sandiest Cinque Terre beach, you can channel your best riviera vibes during high season. Think orange umbrellas, paddle boards and a bar nearby. 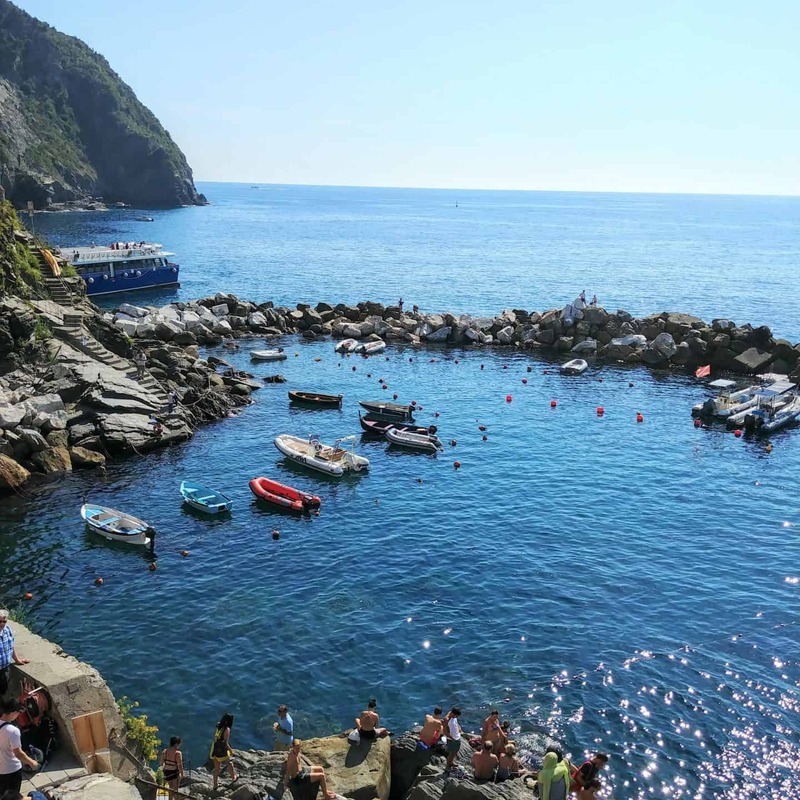 And since it’s also steps from the train station, it will prove to be a great place to begin your walk, hike and tour of the Cinque Terre towns. Getting There: Take the train towards the Monterosso al Mare train station and walk straight towards the beach. Of course, if you decide to drive in, you should be able to find available parking spots during off-season months. Tip: A good majority of Monterosso’s beaches are private, meaning you will need to pack a bag in order to save some Euros. The beach chairs and umbrellas will set you back, so if you’d like to keep things on the cheaper side, hunt for the public beaches. This historical side of the village is as charming as they come but can prove to be quite crowded when the throngs of tourists descend on it during the summer months. 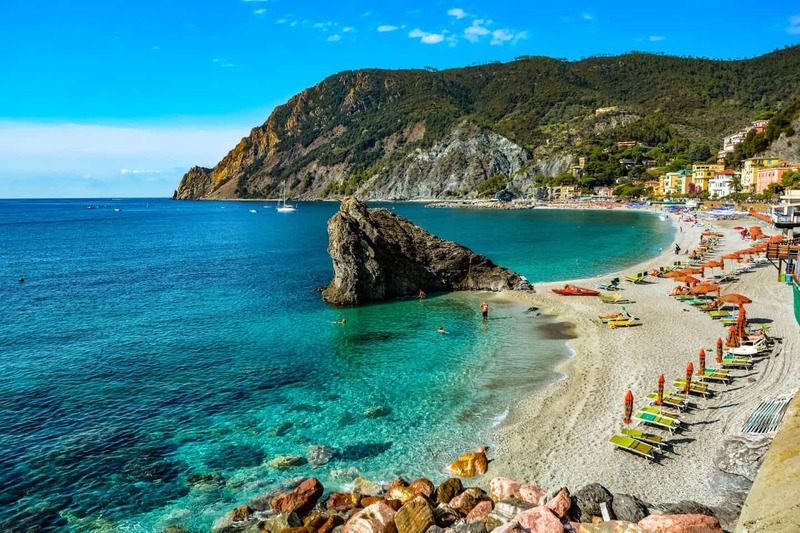 Monterosso beach in the old town also happens to be the second largest in Cinque Terre, making it a great alternative if the other Monterosso beach – above – is too busy. 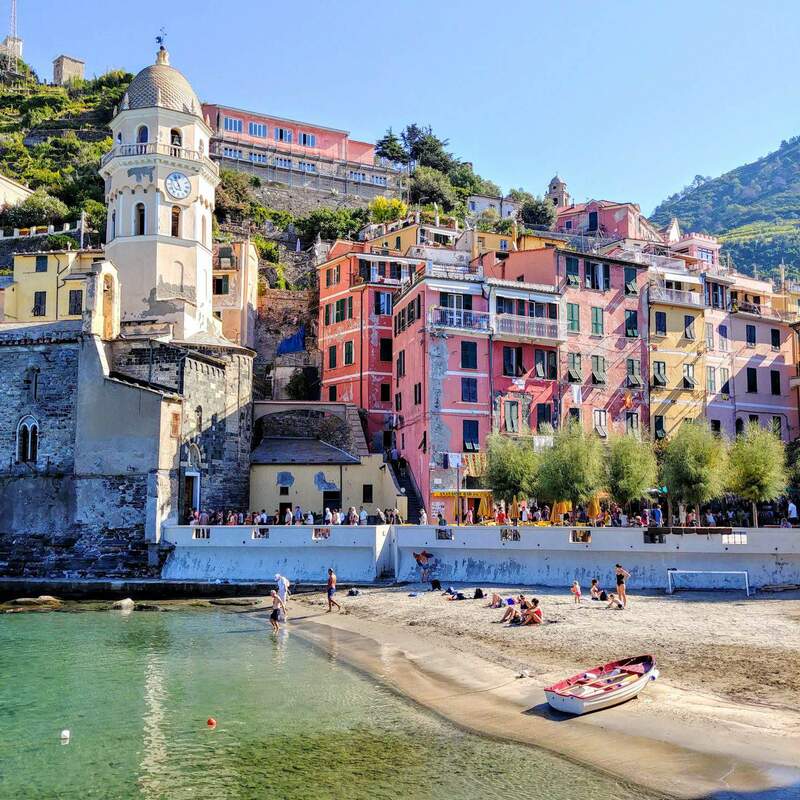 Getting There: Just a few minutes by foot from the Monterosso al Mare station, this village connected by the tunnel should, of course, be the second spot on your Italian seaside adventure. Tip: The Blue Path that connects all five villages essentially starts from this location, so be sure to pack your best pair of walking shoes and a water bottle for this 12 km (world-famous) hike. The beaches at Cinque Terre are a popular hotspot for tourists and locals alike, thanks Vernazza. This village is home to two beaches, a smaller spot located near the main square and a larger strip on the other side. While reaching the beaches can prove to be an adventure due to access via a cave passage, the walk will be worth it. Be sure to pack your camera to take snaps of the Piazza Marconi located on the seafront, nestled in between a castle and a church. Getting There: Hop off at Vernazza station, and then walk yourself towards the ocean. Parking spots are quite limited around this beach, so it’s recommended to go by foot, train, or even sea. 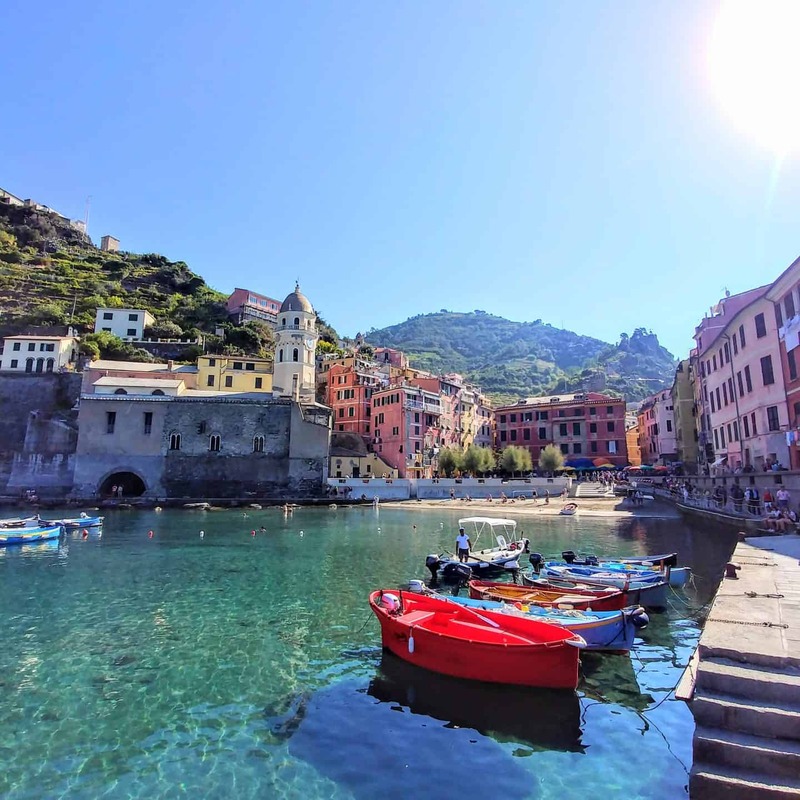 Tip: Some of the best gelato in the region is situated near Vernazza beach, so be sure to grab a sweet treat at Gelateria Il Porticciolo or Gelateria Vernazza. This beautiful beach also doubles as a clothing optional one, so just be prepared when visiting. Reaching this beach also requires you to travel through a 1 km tunnel without much light at all, so be sure to pack a flashlight, or use your cellphone to guide you. Corniglia village is the only Cinque Terre town located right off the sea, meaning it’s only accessible by boat. Gain access to stellar views by following the signs pointing in the direction of the marina. Getting There: Get off at Corniglia station, walk through the dark tunnel or descend along the Blue Path – mentioned above – between Corniglia and Vernazza Beach. Tip: The trip down the Blue Path is quite gruelling, so it’s recommended to take the tunnel. That said, the tunnel has not had light since 2012, so you are to enter at your own risk. If you are able to access this crystalline beach by boat – recommended – you will soon find clean and crisp water, perfect for a quiet afternoon dip. A favourite spot among water worshipers, this small harbour is home to a lovely rocky beach, ideal for a quiet afternoon. Since Manarola is not a traditional sand beach like some of the other Cinque Terre contenders, you and your travel companion can take a cat nap under the Tuscan sun in peace. On your way to the next beach, you can take in the colourful collection of homes overhead by foot or sea, depending what vantage point you’d like and the budget you’re working with. Getting There: Accessible by train and foot, this lovely stretch of Cinque Terre will prove to be a highlight of your action-packed day. Tip: The harbour area is the ideal location for adventure travellers. Simply descend down the rocks and jump right in! 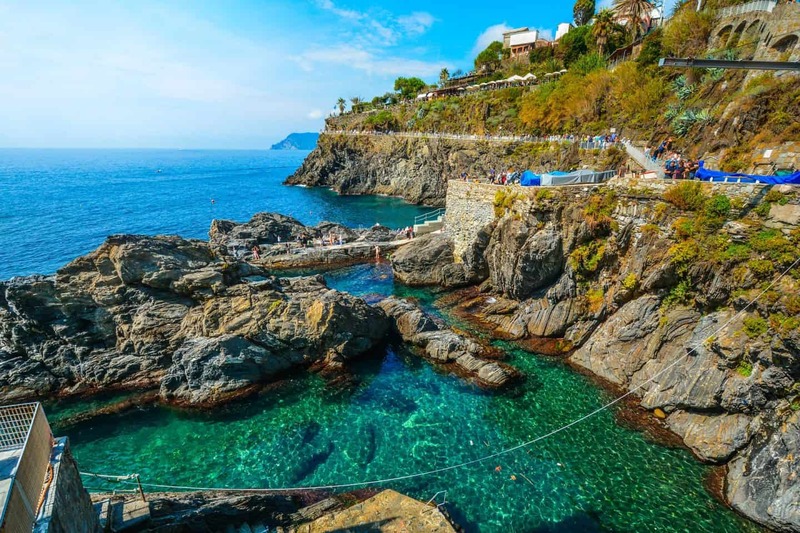 One of the less frequented Cinque Terre beaches, Riomaggiore is lined with rocks and pebbles, making it a haven for nature lovers and adventure travellers alike. Upon arrival, be sure to stop by the local shops and restaurants for delightful bites of Italian culture. After you’ve fed your appetite, head to La Fossola, a rocky little beach located just steps from the marina. If you’re able to walk confidently around this village (footing can be dicey at times) your eyes will be in for a treat. Prepare for sweeping views of the rugged Riviera coastline. Getting There: Get off at Riomaggiore station, turn right and pass through a long tunnel. One road will take you into the centre of town, while the other will take you to the rocky coastline. Tip: This beach is located near a frequented boating pier, making the water around these parts incredibly dark and deep. One of the larger beaches along the Cinque Terre coastline is Levanto, just 60 km from Genoa. From here, you are free to discover historic parts of town, spend time sunbathing on a quieter stretch, or simply enjoy this Italian seaside escape. The beach here also happens to be long and sandy, an ideal stomping ground for those looking to slip peacefully into paradise. Getting There: You can get off at the Levanto train station, or park at one of the nearby accessible spots. 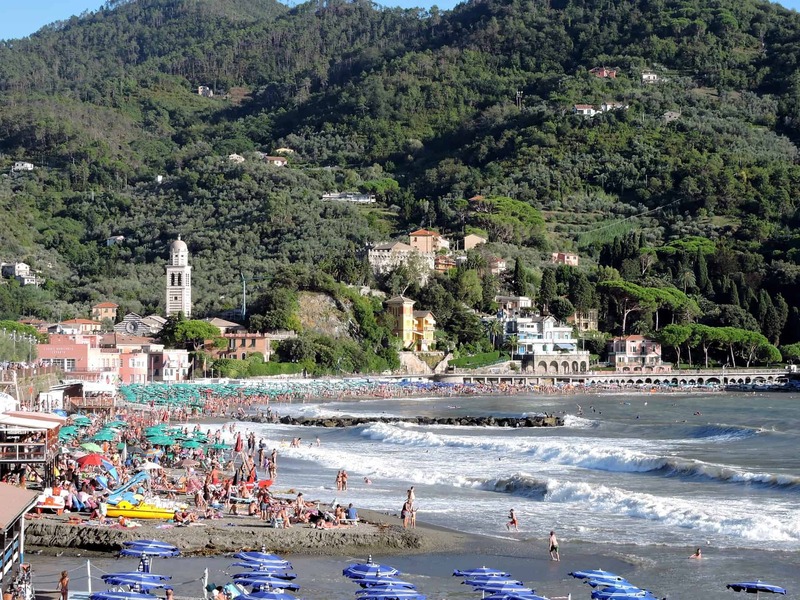 Tip: Levanto has a slew of nightlife possibilities including a couple of clubs and bars. If you happen to be visiting with friends, be sure to book a hotel in advance of your stay to take full advantage of these amenities. On the sleepier side of the Riviera and along the Ligurian coast is Palmaria Island, a quiet enclave measuring 1.6 square km. Year-over-year, visitors from around the world flock to the Gulf of La Spezia for rugged walking trails and renowned beaches. Getting There: Since trains cannot access the island, you will need to travel to the charming towns of Portovenere or La Spezia, and charter a private boat or hop on a ferry from there. Tip: It takes just five minutes to travel to Palmaria Island, so splurge for private transportation as it can afford you unparalleled views of the colourful seaside homes dotted along this world-famous coastal community. The quaint town of Bonassola is situated on the Ligurian coast near Levanto. Bonassola also happens to be just a few miles north of Cinque Terre, offering a quieter reprieve as it’s tucked in between mountains and the sea. With long sandy beaches, clear water and charming shopping nearby, Bonassola will easily become one of your favourite Cinque Terre towns. Getting There: You can either get off at the Levanto train station or take the scenic route and walk from Levanto to Bonassola, which could take around one hour. Tip: Ernest Hemingway once described the town of Bonassola as “so sweet, unforgettable, [and] inexhaustible,” – which still rings true today. If you are travelling throughout Italy, check out this guide to see if Portofino is worth the visit. 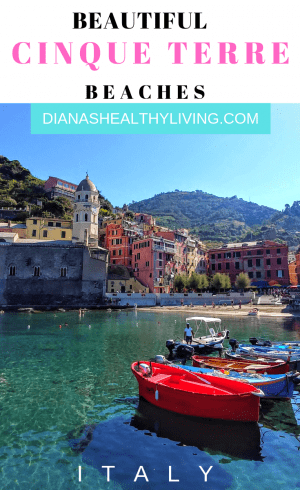 Have you visited the beautiful beaches of Cinque Terre?